Vintage 1966 photo of Ferrari 275 GTB 06785 at the 1000 KM di Monza. 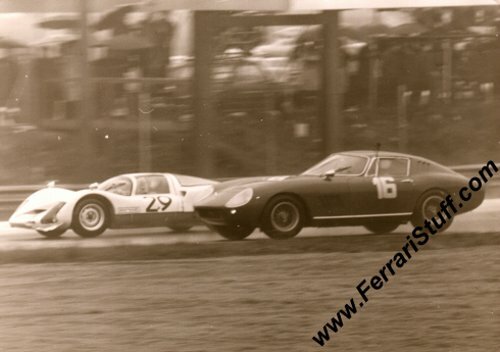 Here we have a vintage 1966 photo of 06785, the Ferrari 275 GTB 6C Short Nose of Siegfried Zwimpfer and Hans Illert during the 1966 1000 KM di Monza on April 25 of that year. 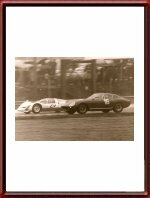 The photo shows 06785, which survives to this day in Sweden, while it is being overtaken by the Porsche 906 (S/N 112) of Dieter Glemser and Collin Davis. Glemser / Davis would finish the race in 7th place while Zwimpfer and Illert finished in 17th place, 17 laps behind winners John Surtees and Mike Parkes with their Ferrari 330 P3 (S/N 0844). The photo is vintage print, i.e. printed shortly after the image was captured on film. It measures some 18 x 13 cm and is in excellent condition for its age. 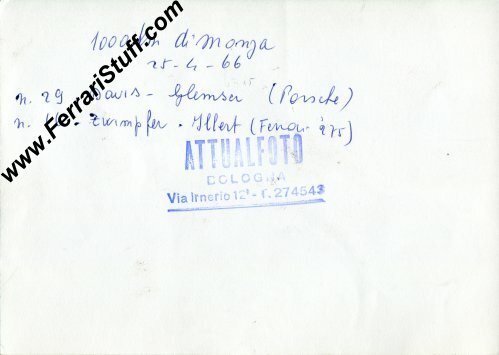 It does carry some notes and the stamp of Attualfoto, Bologna, on the back.